Super Point, 3X Heavy, 2X Short, 3X Wide, Forged, Black Nickel. A true gaff for saltwater flies, the 600SP is one of the most popular Tarpon and big game hooks on the market. 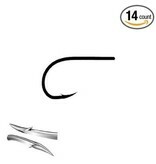 Having a super point the hook penetrates extremely fast even with the heavier wire. Also is a good trailer hook for some of the bigger saltwater poppers.